Lithium-ion batteries are a core component of electric vehicles (EVs), but higher costs have made the vehicles pricey. Here’s a look at the market, and at companies working to cut costs for batteries for EVs and beyond. One of the main obstacles that has inhibited cleantech from becoming more mainstream is the issue of power generation and storage. Despite the numerous advantages of solar power, a key challenge in the sector is making sure that the power generated is both adequate and reliable. For instance, if a building relies exclusively on solar photovoltaics for electricity, uncontrollable factors like a cloudy day can’t impact the technology’s ability to produce power. That’s where the rapidly growing sector of energy storage systems comes in. Specifically, lithium-ion batteries offer a well established cleantech alternative to the typical backups of fossil-fuels and nuclear-based generation. However, lithium-ion batteries are relatively costly, which drives up the price of technologies reliant on this energy source. Luckily, companies like Electrovaya (TSXV:EFL), Nano One Materials (TSXV:NNO) and Oakridge Global Energy Solutions (OTCMKTS:OGES) are working to make lithium-ion batteries more accessible. It seems that lithium-ion batteries are everywhere, and the battery chemistry is the fastest growing and most promising on the market today. According to Battery University, lithium-ion batteries have numerous advantages: their high energy density opens the possibility of higher capacities, they do not need prolonged priming when new, they have relatively low self-discharge (less than half of nickel-based batteries), they are low maintenance and speciality cells can provide very high current to applications (a boon in cases such as power tools). Of course, these batteries have drawbacks as well. Lithium-ion batteries require protection circuit to maintain voltage within safe limits, they are subject to ageing (even when not in use) and they are not fully mature (meaning that metals and chemicals are changing on a continual basis). However, what might be their largest limitation is the price. Currently, lithium-ion batteries cost about 40 percent higher than nickel-cadmium, making them an expensive option for cleantech companies. So, which are companies still willing to shell out for these batteries? Although the market for lithium-ion batteries spans many verticals, in the cleantech sector they are most strongly linked with the electric vehicle market. To meet market demand and to drive down pricing, EV companies are investing heavily in research and development in the lithium-ion space. According to Cantech Letter, the lithium-ion battery market was worth $11.7 billion in 2012 and, by the end of this year, the market is supposed to have doubled. Within this market, global demand for EV batteries was 5,662MWh in 2013 and is expected to jump to 31,100MWh by 2016. The increased demand for lithium-ion batteries should ultimately push the price down, as companies invest in creating the most efficient technology possible. Tesla (NASDAQ:TSLA) is another major leader in lithium-ion battery investing scene. Notably, Sophic Capital reports that, at the close of 2014, Tesla invested $5 billion in the creation of a new lithium-ion battery plant in Nevada. Tesla anticipates that this plant will will manufacture 50GWh of annual capacity by 2020 (enough for approximately 500,000 cares. Furthermore, CEO Elon Musk has stated that the plant could drive down lithium-ion battery costs by a full 30 percent through scale. Indeed, this reduction will be a boon for helping EVs compete with conventional fuel-based vehicles. If investing in this growing market seems appealing, there are several strong companies to choose from. Beyond Tesla, LG Chem (KRX:051915), Samsung SDI (KRX:006400) and Asahi Kasei (TYO:3407) are all major corporations involved in the market. However, there are also number of interesting small-cap up and comers for investors to look at. Take Electrovaya, for example. The Canadian company is engaged in designing, developing and manufacturing Lithium-ion SuperPolymer batteries, battery systems and energy storage-related products has seen 33.8 percent year-to-date growth in its share price. Meanwhile, Nano One Materials is engaged in developing processing technology for the production of high performance nano-structured composite materials. The company’s primary market is the cathode materials supply chain for lithium ion batteries. Its share price has gone up 15.25 percent since the start of the year, and the company was recently approved for a $2.08 million technology commercialization grant from Sustainable Development Technology Canada (SDTC). Finally, Oakridge Global Energy Solutions is the only “Made in the USA” lithium-ion battery system producer, the company’s products are targeted to the golf cart, remote control and unmanned aerial vehicle markets, as well as the home energy storage markets. For its part, the company has seen a 58.92 percent growth in share price since the outset of 2016. The increasing share prices for these companies reflects one common truth in the lithium-ion battery market: there is significant growth in this sector. Innovations in the space will help to reduce the cost of producing these batteries, helping environmentally friendly cars to become more competitive on the market. 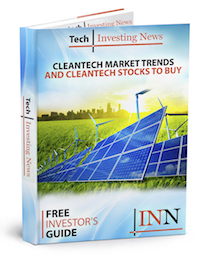 Editorial Disclosure: Oakridge Global Energy Solutions is a client of the Investing News Network. This article is not paid for content.